The ECN62BL is a stylish flat glass extractor in black. It has 3 speeds, push button control and built in LED lights to provide good illumination. The ECN72BL is a stylish flat glass extractor in black. It has 3 speeds, push button control and built in LED lights to provide good illumination. The CTE61SS 60cm extractor is a space-saving telescopic hood, designed to fit under your cupboard and slide away to save space when not in use. It features 3 speeds, rocker switch controls and LED lights to provide good illumination of the cooking area. The CTE9SS 90cm telescopic hood is perfect for smaller kitchens as its designed to fit under your cupboard and slide away to save space when not in use. It features 3 speeds, rocker switch controls and LED lights to provide good illumination of the cooking area. The ECR90BL traditional chimney extractor will go perfectly with the RVC931BL range cooker. In a classic chimney style, this extractor features a front decorative rail, LED lights, 3 extraction rates and push button control. The CDA EVC41BL cylinder extractor will make a big statement in any kitchen with its cylindrical design. It has many great features such as 3 speeds plus an intensive setting, the option of ducting out or fitting with re-circulating charcoal filters, a filter saturation warning light, clean air function and a timer. The EVPC91SS is a corner chimney extractor offering many great features. It has 3 speeds plus an intensive setting, the option of ducting out or fitting with re-circulating charcoal filters, a filter saturation warning light, clean air function and a timer. This extractor is perfect for the corner hob kitchen design, it utilises space extremely well and will fit your lifestyle and kitchen design perfectly. The EVQ71BL is a 70cm circular extractor in black glass. This hood will make a bold statement in any kitchen whilst having many great features such as A++ energy efficiency, touch control, LED lighting and a timer function. The EXA80SI is a beautifully designed 80cm angled extractor. Not only does this hood have a stunning and ultra-modern design, it also has many great features including A rated energy efficiency, touch control, a timer and a filter warning light. With one of the best extraction rates and lowest noise levels in the CDA range, this model would be a great addition to any home. The CDA EZA60BL is a 60cm angled extractor in a stylish black glass. It boasts many great features such as touch control, timer function, low noise levels, high extraction rates and is B rated for energy efficiency. This extractor will ensure an odour free kitchen in no time. The EZA90BL Designer angled extractor boasts many great features such as touch control, timer function, low noise levels, high extraction rates and is A rated for energy efficiency. This extractor is available in two widths, 60cm and 90cm and has a crisp LED strip light to ensure clear illumination of the cooking area as well as adding a stylish touch to the kitchen. The EZT90BL Designer T-shape extractor is part of the DKR range. This extractor is not only stunning, it also boasts many great features such as touch control, timer function, low noise levels, high extraction rates and is B rated for energy efficiency. This extractor has an ultra-modern look with a crisp LED strip light to provide good illumination of the cooking area, whilst ensuring an odour free kitchen in no time. The ECN92BL is a stylish flat glass extractor in black. It has 3 speeds, push button control and built in LED lights to provide good illumination. The EKN60BL is a stylish flat glass extractor with LED edge lighting in three colours, blue, red and green. It has 3 speeds, touch control and built in LED lights to provide good illumination of the cooking area. The EKN60SS is a stylish flat glass extractor with LED edge lighting in three colours, blue, red and green. It has 3 speeds, touch control and built in LED lights to provide good illumination of the cooking area. The EKN70BL is a stylish flat glass extractor with LED edge lighting in three colours, blue, red and green. It has 3 speeds, touch control and built in LED lights to provide good illumination of the cooking area. The EKN70SS is a stylish flat glass extractor with LED edge lighting in three colours, blue, red and green. It has 3 speeds, touch control and built in LED lights to provide good illumination of the cooking area. The EKN90BL is a stylish flat glass extractor with LED edge lighting in three colours, blue, red and green. It has 3 speeds, touch control and built in LED lights to provide good illumination of the cooking area. The EKN90SS is a stylish flat glass extractor with LED edge lighting in three colours, blue, red and green. It has 3 speeds, touch control and built in LED lights to provide good illumination of the cooking area. The EKP60BL has a striking curved glass black design which is both chic and practical. The EKP60BL also has LED edge lighting in three colours blue, red and green creating an ambiance. The extractor has 3 speeds with touch control and aluminium grease filters. The EKP90SS is a stylish curved glass extractor with LED edge lighting in three colours, blue, red and green. It has 3 speeds, touch control and built in LED lights to provide good illumination of the cooking area. The ECH61SS 60cm chimney extractor in stainless steel has a contemporary design which allows it to be a main focal point in any kitchen. It has 3 speeds with push button control, a twin fan motor and built in LED lights for good illumination. The ECH61BL 60cm chimney extractor in black has a contemporary design which allows it to be a main focal point in any kitchen. It has 3 speeds with push button control, a twin fan motor and built in LED lights for good illumination. The ECH71SS 70cm chimney extractor in stainless steel has a contemporary design which allows it to be a main focal point in any kitchen. It has 3 speeds with push button control, a twin fan motor and built in LED lights for good illumination. The ECH71BL 70cm chimney extractor in black has a contemporary design which allows it to be a main focal point in any kitchen. It has 3 speeds with push button control, a twin fan motor and built in LED lights for good illumination. The ECH91SS 90cm chimney extractor in stainless steel has a contemporary design which allows it to be a main focal point in any kitchen. The ECH91SS has 3 speeds with push button control, a twin fan motor and built in LED lights for good illumination. The ECH91BL 90cm chimney extractor in black has a contemporary design which allows it to be a main focal point in any kitchen. The ECH91BL has 3 speeds with push button control, a twin fan motor and built in LED lights for good illumination. The ECH101SS 100cm chimney extractor in stainless steel has a contemporary design which allows it to be a main focal point in any kitchen. The ECH101SS has 3 speeds with push button control, a twin fan motor and built in LED lights for good illumination. The ECH101BL 100cm chimney extractor in black has a contemporary design which allows it to be a main focal point in any kitchen. The ECH101BL has 3 speeds with push button control, a twin fan motor and built in LED lights for good illumination. The CDA ECP62SS has a striking curved glass stainless steel design which is both chic and practical. The extractor has 3 speeds with push button control and built in LED lights to provide good illumination. The CDA ECP62BL has a striking curved glass black design which is both chic and practical. The extractor has 3 speeds with push button control and built in LED lights to provide good illumination. The CDA ECP72SS has a striking curved glass stainless steel design which is both chic and practical. The extractor has 3 speeds with push button control and built in LED lights to provide good illumination. The CDA ECP82SS has a striking curved glass stainless steel design which is both chic and practical. The extractor has 3 speeds with push button control and built in LED lights to provide good illumination. The CDA ECP82BL has a striking curved black glass design which is both chic and practical. The extractor has 3 speeds with push button control and built in LED lights to provide good illumination. The CDA ECP92SS has a striking curved glass stainless steel design which is both chic and practical. The extractor has 3 speeds with push button control and built in LED lights to provide good illumination. The CDA ECP92BL has a striking curved glass black design which is both chic and practical. The extractor has 3 speeds with push button control and built in LED lights to provide good illumination. The CDA EVP101SS is a contemporary stainless steel extractor with 3 speeds plus an intensive speed. The EVP101SS has a touch control panel, as well as a filter saturation warning light that makes maintenance hassle free. It also has a 15 minute timer allowing the extractor to switch off automatically after cooking. The CDA EVP121SS is a contemporary stainless steel extractor with 3 speeds plus an intensive speed. The EVP121SS has a touch control panel, as well as a filter saturation warning light that makes maintenance hassle free. The extractor has a clean air function to keep your kitchen smelling fresh. It also has a 15 minute timer allowing the extractor to switch off automatically after cooking. The ECN62SS is a stylish flat glass extractor in stainless steel. It has 3 speeds, push button control and built in LED lights to provide good illumination. The ECN92SS is a stylish flat glass extractor in stainless steel. It has 3 speeds, push button control and built in LED lights to provide good illumination. The EVA70BL is an angled chimney extractor with a contemporary design. It can be ducted out or fitted with re-circulating charcoal filters. 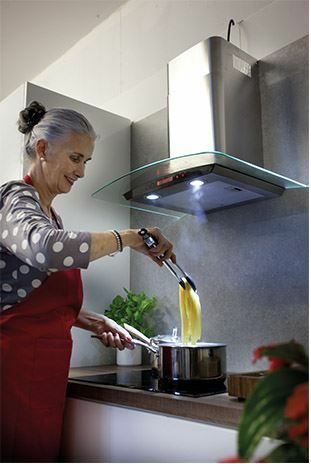 It has 3 speeds and LED lights for flexibility and ease of use whilst cooking. It also has a 15 minute timer meaning there is no need to turn off the extractor after cooking. 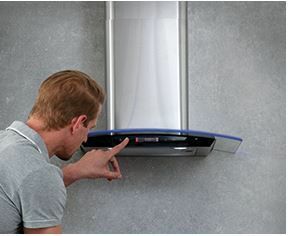 The EVA90BL is an angled chimney extractor with a contemporary design. It can be ducted out or fitted with re-circulating charcoal filters. It has 3 speeds and LED lights for flexibility and ease of use whilst cooking. It also has a 15 minute timer meaning there is no need to turn off the extractor after cooking. The CDA EVG6SS is a 60cm clear glass extractor with great aesthetics and functionality to match. It is touch controlled, with 3 speeds plus an intensive setting. It comes with an aluminium grease filter, a filter saturation warning light, clean air function and a 15 minute timer to provide efficient and effective extraction. The CDA EVG6BL is a 60cm black glass extractor with great aesthetics and functionality to match. It is touch controlled, with 3 speeds plus an intensive setting. It comes with aluminium grease filters, a filter saturation warning light, clean air function and a 15 minute timer to provide efficient and effective extraction. The CDA EVG9BL designer extractor with black glass side panels, will make a big statement in any kitchen with its geometric shape. The EVG9BL has 3 speeds and intensive with a touch control panel including a 15 minute timer so the extractor can switch off automatically after cooking. Another great feature this extractor has is peripheral aspiration that ensures greater efficiency when extracting. Our most popular style of extractor is the chimney with models available in curved glass, flat glass, traditional box design, angled or curved. With timers, boost functions, powerful extraction rates, filter warning lights, ducted or recirculating installation options and dishwashable grease filters, this range is practical and easy to maintain. The adjustable extraction speeds allow you to effectively remove steam and grease from your kitchen easily and we have developed the motors to keep them as quiet as possible during use. The chimney style covers a range of designs from the traditional, triangular shaped boxy hoods to the curved glass designs, angled glass, the linear collection, our cylinder model and the unique corner extractor for more awkward kitchen shapes. Those models with a chimney section are adjustable in height to allow for all different ceiling spaces and rooms shapes. They are flexible in installation too as you can either fit the cooker hoods with ducting to clear cooking grease, smells and steam to the outside or install them to recirculate through charcoal filters back into the room. Simply click on your chosen product model to find the coordinating charcoal filter code for your cooker hood. If you want to install your extractor to recirculate cleaned air back into your home then simply call our Head Office to order charcoal filters and we will post them out to you directly. They are easy to install and remove with a click and twist action. We recommend that you change charcoal filters about every 6 months to ensure that your extractor is able to work at its best. Once saturated, the filters will not be able to remove grease and smells effectively from your kitchen. Our estimate is based on the average household usage for a family but if you know that you use your cooker more or less frequently then you will need to adjust this estimate accordingly. Many of our models have filter saturation warning lights to alert you that the filter now needs changing. We recommend that you go for an extractor at least as wide as your hob. This is to ensure that the filters are able to cover the area that grease and steam are coming from and provide the most effective extraction possible. Any smaller and too much steam will be escaping around the edge. It is fine to go larger though and we find that the largest extractor styles make a real statement in the kitchen. Our chimney range comes with adjustable extraction speeds with extra boost functions for when you need it most. There are options with push button and touch control, depending on what style suits you best. Look out for our edge-lit models that feature extra ambient lighting on the edge of the glass. Some of the extra features are built in to your extractor to improve performance and user experience. 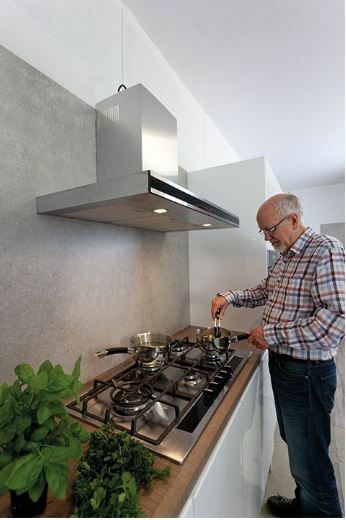 For explanations on all our cooker hood functions, visit our buying guide to dispel the myths and cut through jargon to find out the low down on peripheral aspiration, clean air functions and noise levels.